Learner Rider Permit ?- What’s Next? 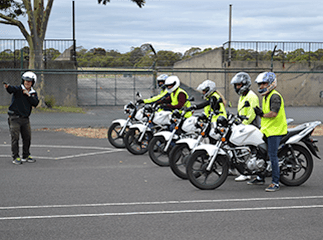 If you have recently gained your motorcycle learner permit it is really important you continue to develop your skills as a rider. With experience continue to develop your practical control skills and your defensive Roadcraft Skills. There are very specific ways in which you can enable yourself to develop safely as a new rider and we will outline some of them here, and just a reminder that if you are having difficulties with any areas of your riding, please give us a call. Sometimes we might be able to help with just a little bit of advice over the phone. Always be responsible for your own safety. You should never assume that other road users will help you to stay safe, whether you have the right of way or not. Remember it’s no use being in the right if you’re also in the back of the ambulance. Ride as regularly as you can. One of the common mistakes we hear of with new riders is that they simply do not ride often enough. If they are social riders the tendency is to ride with groups of friends on occasional weekends, and these weekend rides tend to go for a whole day or at least a full afternoon. Unfortunately, this can be a very slow way to develop skills for the new rider and can even prove to be quite dangerous if the new rider is riding with more experienced, faster riders, is not being sensibly mentored, and is trying to push the envelope it puts them at greatly increased risk. 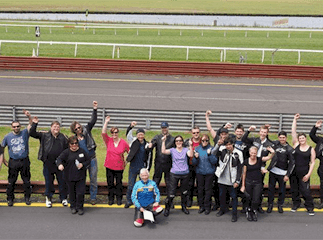 If you ride with groups, ride with people who are prepared to sensibly mentor you and help you to understand the basics of safe riding in traffic, rather than just trying to encourage you to ride faster. Regular, short sessions in quiet traffic areas are much more beneficial for the new rider. 30-45 minute sessions around your own neighbourhood with lots of stop and start riding is going to help your basic skills (smooth throttle roll-on & roll-off, braking, gearchanging, headchecks and mirror checks) to become “muscle memory” before you venture into heavier traffic situations. When you feel confident enough to venture into heavier traffic, think about heading out on a Saturday afternoon or a Sunday afternoon for about one hour. During these times you will be exposed to some traffic but not heavy midweek peak hour panic. Assume you’re invisible! – When you start to get out into traffic, always imagine that you are invisible to other road users. This will help you become defensive and never assume that another road user has actually seen you even if they have looked in your direction. The secret is to use your observation skills (look as far ahead as possible) to see the threat and respond by slowing down and moving away to create more survival space. (LOOK, SLOW DOWN, MOVE AWAY) should be your mantra for as long as you ride a motorcycle. Head out on purposeful practice sessions regularly. It’s terrific to go on social rides but you should also plan your own skills development sessions as a regular part of your riding program. Maybe head off for an hour or so to a local industrial estate on a Sunday afternoon (they’re only busy from Monday to Friday), on your own to carry out some purposeful practice of your base skills, i.e. cornering, braking and swerving. You should start out practicing these skills at relatively low speeds and build your speed in small increments as you go. Tactics and strategies are vitally important for the new rider. Always plan to complete your rides following a route and time of day which will give you the best possible road and traffic conditions. Never ride if you’re angry, tired, unwell or substance-impaired (incl. alcohol). Never ride through areas where you have recently noticed major roadworks etc and never ride during hours when you would normally be asleep. It is also very important that you start to build your skills and confidence in different weather conditions such as rainy and windy days. Do this step by step and stay close to home initially so that you can easily return if you feel uncomfortable or unsafe in adverse conditions. The secret to riding in these types of conditions is to slow down to a speed which suits the conditions and relax as much as possible on the bars so that you are not putting adverse inputs into the bike as you ride. ATGATT – “All The Gear All The Time”. It’s really important that even if you’re just going for a half-hour ride that you ALWAYS wear appropriate protective gear. It will save your head, your skin and your limbs so invest in some quality motorcycle gear – IT’S A MUCH BETTER INVESTMENT than buying a slip-on muffler to make your bike sound better or something similar but equally unnecessary. GEAR IS VITAL – NEVER LEAVE HOME WITHOUT IT!!! Learn how to systemise your riding. Going through a systemised list of procedures for intersections, curves, crash avoidance strategies etc is a sound way to develop defensive skills. This will avoid inadvertently missing important safety procedures as you ride. As you develop skills and confidence you should also guard against complacency as this can encourage contempt and aggression towards other road users. If at any time you find you experince a “near miss” in traffic or maybe find yourself “getting it wrong” mid-corner, always try to analyse what you did that contributed to the situation. Even in traffic situations where we feel that someone else has encroached on our safety, there is usually something that the rider did which contributed to the situation, i.e. positioning for visibility, anticipating and responding to hazard earlier. You will find that development of skills and confidence in a methodical and progressive manner will make your riding so much more enjoyable as it keeps you safe. We at Ride-Tek MTA sincerely hope that you enjoy many years of happy riding. Step 2/ Is held on-road coaching ride on a route that is pre-determined. The length of time for the ride is slightly flexible is determined by weather conditions & traffic. There is a maximum of 5 participants to one instructor. 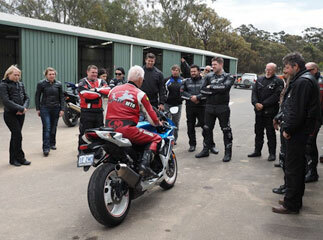 The instructor will review your riding and provide feedback on your ride. The instructor will also discuss practical ways to enhance your safety. 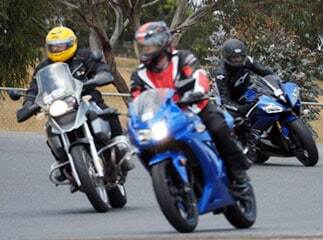 Every rider takes a turn leading the ride with the instructor observing your riding skills. How do I prepare for my Check Ride? Buy a motorcycle is soon as you have your have been successful in obtaining your learners Permit. To get the most out of your Check Ride it’s important that to practivce your riding often. Make sure you have sufficient exprerince to be confident in traffic and feel comfortable to travel at the speed limit. Every rider develops at a different rate. Initially it is safest to practice your riding in quiet areas and gradually ride in more challenging situations. 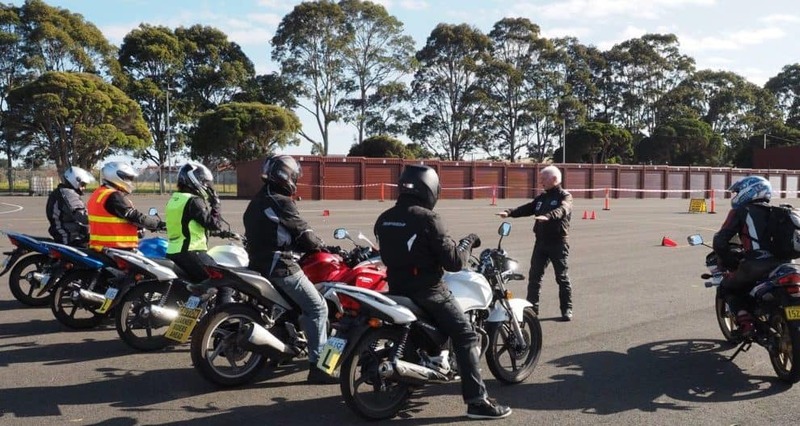 If you have any questions regarding development methods and/or would like some information regarding our other training and courses such as : Check Ride, Licence Assessments, Road Craft Skills Development, and On-Road 1-2-1 (with intercoms), please do not hesitate to contact us on 1300 788 382.